U.S. presidents—fictional or not—have had a major impact on video games. When a game has something to do with the United States, there’s a good chance the Commander-in-Chief is gonna show up. We gathered a few remarkable U.S. president cameos below. Most of them are goofy, but there are a few serious appearances, too. 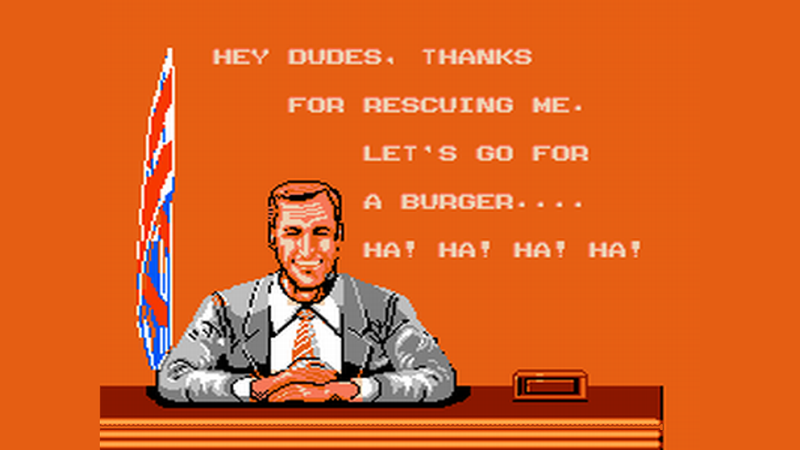 The president is in a good mood after being kidnapped in Bad Dudes Vs. DragonNinja, and although he looks a bit older in the arcade port (here), compared to the NES version (up top), he’s still having fun. Who doesn’t like burgers? The fictional female president of the United States Elizabeth Winters has a hard time dealing with those pesky Russians in Vanquish. There isn’t the faintest hope for Adam Bedford, the president in the alternate 2013 game of the Resident Evil universe. President Huffman’s brain is placed into a giant mecha to fight the Furon invasion (well, you can’t blame them, the game is set in the 50s). You can spot George Washington and Thomas Jefferson (and a few other famous faces from US history) in the “Founding Fathers” screen of Sid Meier’s Colonization. It became a tradition to include U.S. presidents as unlockable secret characters in the NBA Jam games, which famously featured Bill Clinton in the 1993 game and George Bush and Barack Obama in the 2010 remake. Obama also appeared in the Madden series (first in Madden ‘11), but his appearance isn’t as exciting as in NBA Jam. Phew! Washington isn’t the worst leader in Civ 5. Solidus aka George Sears was elected as the youngest U.S. president at only 28 years of age. He’s designed to age rapidly, so the public thought he was much older than he is. One of the Founders’ Motorized Patriots is modeled after George Washington in Bioshock Infinite. They are tour guides with gatling guns. What could go wrong? It’s not just a cameo. Saints Row IV’s main character IS the president of the United States. And he’s one hell of a president! Solidus Snake might be the coolest fictional U.S. president in a video game, but surely Metal Gear Rising’s Senator Armstrong is the coolest, most badass fictional senator.